I’m (John) waiting in Vienna airport for my connecting flight home coming from Amman Jordan, and I am still completely inspired and moved by our visit to Palestine. Three days ago I had arrived with Shakti in Amman, to be met by the people from UNRWA who then drove us by road on to Ramallah. This was to be our final concert after the Indian tour. After passing many, many checkpoints and crossing the Allenby Bridge, we eventually arrived in the occupied territories and the city of Ramallah. I can say truthfully that I was thrilled to be there in spite of the fatigue of traveling and a long early morning flight. We were met at our hotel by the people of Al Mada, the UNRWA and UNICEF, without whose help our concert would never have been possible. They were as thrilled as we were, that we had actually made it to Ramallah. This was the culmination of a dream going back several years that had come true, and having coordinated over many months with Al Mada and the UNRWA, we felt as though we were meeting old friends. What we found in Ramallah in particular and Palestine in general, is a country and people who embody the legendary Arabic hospitality. We were treated like princes. The following day we played our concert to a house that had sold out the day the tickets went on sale, and an enthusiasm rarely seen. The tickets were $5, but frequently they were subsidized by the different associations since to the young people of Palestine, $5 is a lot of money. In order to help the Al Mada association, Shakti played for free. This is the only non-governmental organization in Palestine that treats traumatized children through music. Unfortunately, there are many traumatized children in Palestine. For anyone who would like to know more about Al Mada please click here. My personal motivation for going to Palestine came through the work Daniel Barenboim is doing there, and he really was the kick starter to my idea to attempt to organize a concert in Ramallah. When I told him about it several months ago, he was delighted. Of course there are other motivations, my personal conviction that music is a true power for healing, but some I only realized while being in Palestine. We’ve all heard about the ‘situation’ in Palestine, but nothing you’ve heard or seen compares to being there and seeing with your own eyes what’s really going on there. There are many, many things happening that never make the news and should. Palestine is in dire need of the world’s attention. I knew before coming, that I had come here to share the joy and love that we as musicians know is the only reality in life, and in music these can be shared. What I realized very quickly after my arrival, was that I had come to feel their pain which is immense. What impressed me was the quiet dignity with which they carry this pain on a daily basis. Of course, wherever there is pain, there is also joy, and we as a group, saw and felt the joy and happiness that our friends there experienced on our arrival, and later in our concert. They in turn, saw the pain that we experienced on seeing the realities of life in Palestine. I now know, that once you have experienced the pain and joy of a people, they become part of you and your life, and this is what happened to us. This is not the place to detail the oppressions that the Palestinian people are subject to, but the ‘situation’ must change. In 1984 I wrote a piece called ‘The Wall will Fall’ and five years later the wall fell and Germany reunified itself. I don’t believe my tune made the wall fall, but I know for certain that music helped the wall fall. Perhaps soon I will write another tune called ‘The Other Wall will Fall’ in the hope that the wall that divides Israel from the West Bank, and Palestinian families from each other will also fall, and a peaceful co-existence will triumph. In ending, I can say that having been once to Palestine, I really want to return again and even dream about more internationally known groups and musicians making the effort to go to Palestine to share their humanity. It’s not easy, but who ever said that anything good comes easy? I love this…. so true and so aptly portrayed!! Thank you for sharing your experience…and keep up your tireless, highly compelling work on world music!! Follow a path that has a heart .. What power has the language of music. It brings light blazing against destructiveness. God bless those who are armed with compassion and inner strength as you and not with guns. God bless you great men bearers of cosmic awareness. Thank you for your inspired words, and for drawing attention to the situation in Palestine. Bless you John!I admire the way you follow your dreams!Ragards from one of your bulgarian friends in …Stockholm!!! You mention the « situation » without having the courage to say what you really mean. But your implication is clear. Have you nothing to say about the Iranian-backed terrorists who now rule Gaza and are the source of the misery that both Palestinians and Israelis feel daily? A fan for 30 years is no more. Thank you for talking about the situation in Palestine. They have been made to suffer for far too long. Wonderful note. You are the best! As usual…Love to you. Wonderful, John. Kudos to you and RS! Thanks, John. You continue to inspire us, not only with your music, but with your deeds as well. May your light continue to brightly burn. You continue to inspire us on a personal, professional,musical, and Spiritual level. You remain ever the inspiration, John. As does Zakir. Thank you for being the great gift that you are. 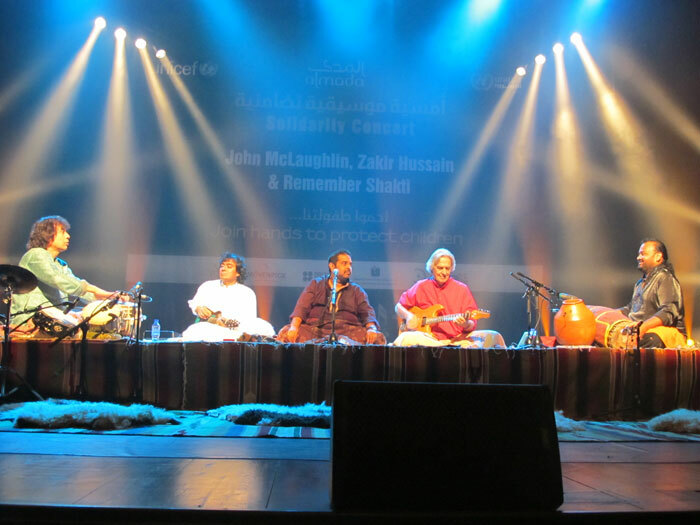 Many, many thanks to John McLaughlin and Shakti for donating their time and talents to the people of Palestine. This not only reflects profound decency, it also reveals their insight into the many critical problems of the indigenous people there. i learned of your site from a friend and couldn’t resist checking it out. I am a big fan of yours and have followed your music for years. I have bought most of your recordings and I also am a proud owner of your « This is the way i do it » dvd. I am happy to learn of your reaching out to the Palestinian people and I commend you for your humanitarianism. I look forward eagerly to your next release and I pray that God smiles on you. Thx for this wonderful initiative. Unfortunately far too many people seems reluctant to acknowledge the sad situations of the Palestinians. Hope the joy of your music can make a significant difference! Bravo! God bless you and all the people involved! Truly wonderful …your visit to Palestine..
John, thank you, and all the brave members of Shakti, for doing this. Seems to my mind that these poor fellow human beings have been totally forgotten and/or ignored for far too long. The hopelessness must be crushing. Here in the States, it seems as if the mere mention of conditions in Palestine immediately classifies one as anti Israel at best, and a ‘terrorist sympathizer’ at worst. This generally comes from people who couldn’t find Palestine on the map with ten hints, two hours, and a flashlight. What to do? Again, thank you all, and all the best to all. May all children, the world over live in peace and harmony. Blessings to you and yours John. The other wall WILL indeed fall my friend! Thanks John for your selfless gift of music. I will always remember the show at club Bene in NJ USA you said » In music we are all one » Keep the spirit. see you next time in NY. Thanks for the great concert, I hadn’t seen you or shakti live and am thrilled that I could see that in Ramallah. Thanks also for the piece above, Palestine can use it. Daniel Gilbert, Good and please don’t let the door hit you on the way out. Zionists will attack John, just like they attack anyone who speaks one word of truth about the reality of the Zionist Occupational Government and legacy of crimes against humanity, terrorism, greed and destruction. The American media is not allowed to say one word critical of Israel or their policies otherwise they phone lines are instantly flooded with thousands upon thousands of threats and complaints (of anti semitism, cute joke isn’t it?) If you say one word about the reality of the evil that is Israel you are labeled as an anti Semite. You Ashkenazi’s aren’t even a semitic people. 1984 is reality. no means yes, yes means no. I honestly, don’t want to live on this planet anymore. Take one look at any Israelis news outlet, website, and you will see how violent and angry these people are. They cheer for blood, nothing makes them happier than to hear about other people suffering. They never show any signs of altruism or humanity. Anyone with open eyes who isn’t blinded by bias an see the reality of the situation. Who really rules Gaza, Mr. Gilbert? Gaza is known as the world largest open air prison for a reason, buddy. Great work John! As always you are a deep source of inspiration. lots of best wishes…you look very happy…..look me up on google margo thatcher photographer…..margo…. This situation is problematic. It seems never ending. I suspect both sides have their faults. My good friend John McGrail wrote a song called « Sons Of Abraham » and it identifies no good guys or bad guys. But it does speak to the point that they all come from the same root. Harmony should not be so out of reach. If Mr. McLaughlin only saw the good people it is better he did that than nothing. Ok to sympathize with innocent people while recognizing reality. The separation fence has saved many innocent children in Israel, jew and arab alike, from being killed and maimed by nail bombs brought in from the West Bank. That’s a lot different than the Berlin Wall. When the arabs stop indocrinating their children with hatred and give up the war to destroy Israel, they will relieve themselves of the hardship of war. Well-spoken John! It is a bout time someone within the celebrity cadre stands up for Palestine! My name is Kenneth Karlstrom. I have been following your musical and spiritual endeavors since the beginning of the 70’s. To me and several of my fellow musicians you have steadfastly been, and still are, an example of what determined striving – musical or otherwise – can accomplish in a person’s life. You contribute to making your fellow man think, feel and reflect upon various less exposed or obvious corners of human existence. I was deeply moved by your account of your visit to Palestine. You have demonstrated to the world that you don’t just talk the talk, you walk the walk. Having sat in meditation with Sufi’s, I came to realize what music means to them in their culture. It is the breath of life. The song of God. They feel it and honor it deeply. For you to share your music with them is a beautiful gesture of love. Thank you for promoting healing and love in this very difficult part of the world. As an American, it pains me greatly the part my government plays in this painful « situation ». You have inspired me to take action in promoting greater understanding of Palestine to the American people. Thank you for your wonderful work. Love when Good is happening!! This is it!!! Love and solidarity all over!!! Thanks for the spirit that shines in the music of you John..
my message in my own music, Love, Peace, Tolerance, Brotherhood. To John « Mahavishnu » I wish you health, peace, love. NEVER STOP PLAYING!!! LOVE, The Zen GUITAR MASTER Phil Weaver.